Nobody likes to be scammed, duped or ripped off. 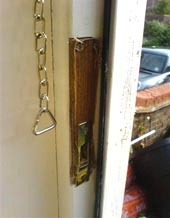 Unfortunately the Locksmith trade is not without its share of companies trying to deceive you. Take care when deciding who to use. Well, this one takes some beating, the 3 pictures here show you the inside, the outside and the door frame views. 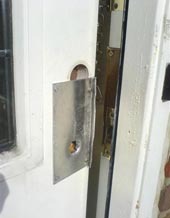 The "locksmith" removed the existing locks and has fitted a piece of scrap aluminium to both sides of the door. 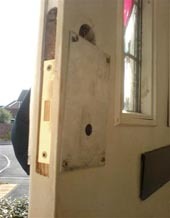 He has also badly fitted the wrong lock into the door. One the worse bodges I've seen. 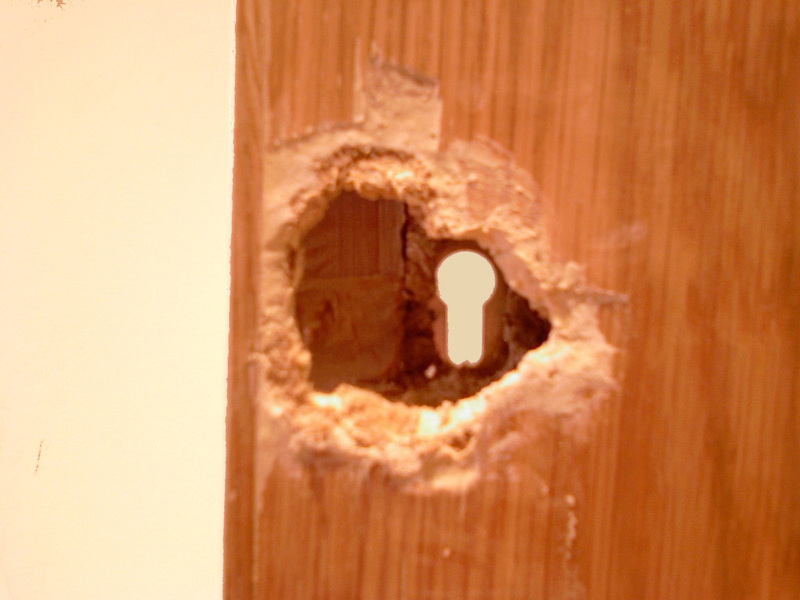 This picture shows a hole over 2" across made by a "cowboy locksmith" called from the telephone book. 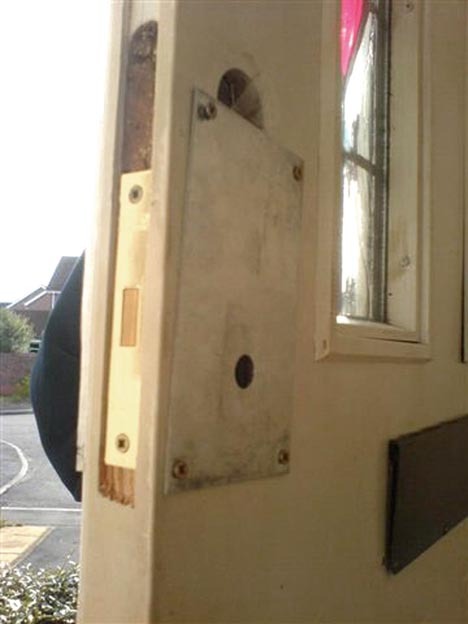 There was no need to make a hole in the door at all and this door was ruined. 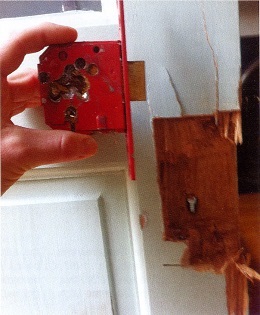 This picture shows a Chubb 5 lever mortise lock (or what used to be one!). 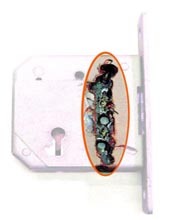 The cowboy in this example has drilled quite a number of holes (circled yellow) and clearly had no idea what he was doing. The fragments on the right are what remains of the internal parts. 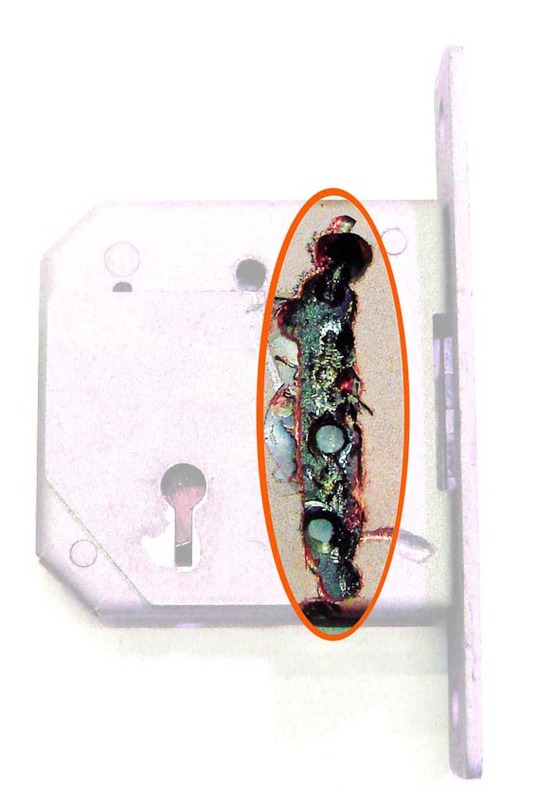 Even with this level of destruction he still couldn't open the door and resorted to using a crowbar, just look at the areas circled orange. 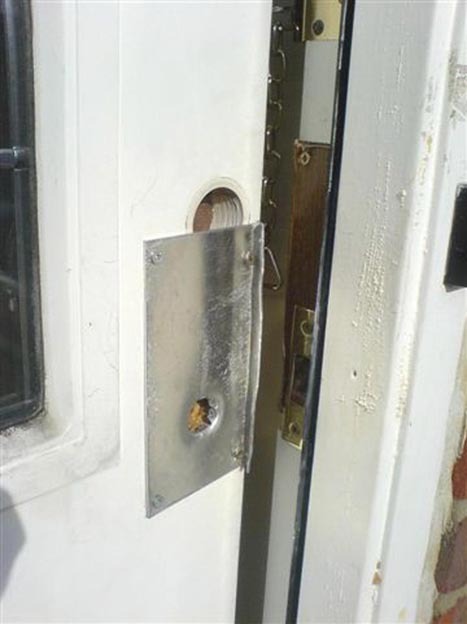 Another new door required. 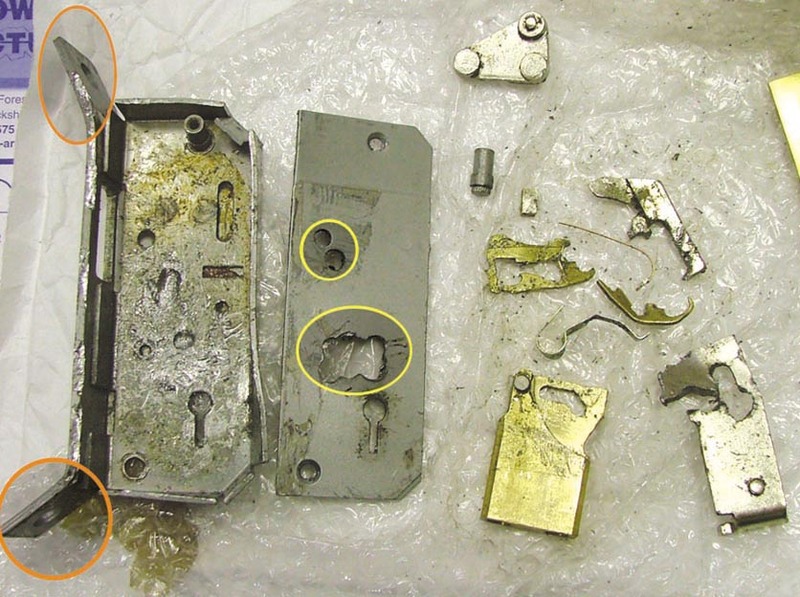 This popular Chubb mortise lock above has has been opened by practically cutting the entire lock in half. 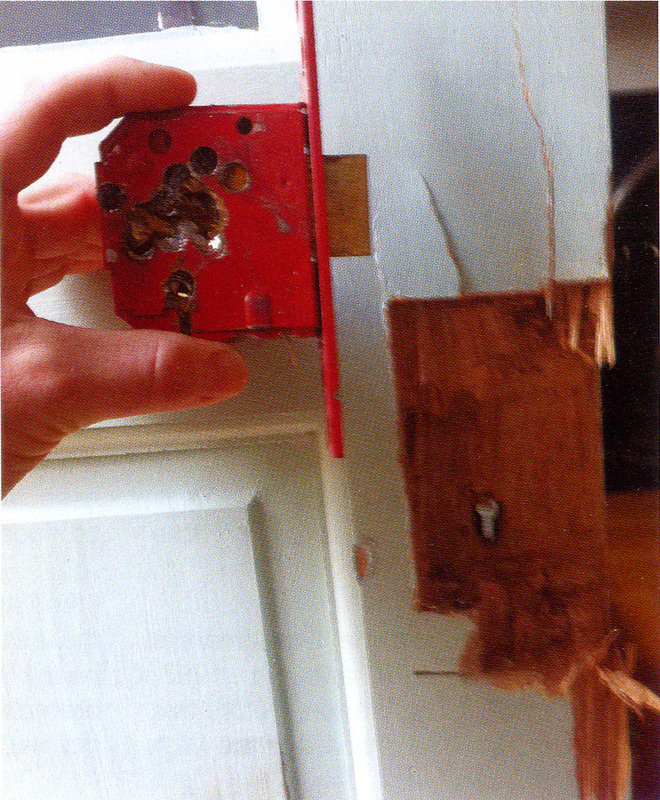 In order to do this there was enormous damage done to the customer's door. A truely fine example of a cowboy at work. It would have been time consuming to do this level of destruction and an expensive job to correct for the customer. Do they show a true contact address (does it have a street number? does it have a vague address like 'Lock House, High Road, Anytown'?). When you telephone them ask for their address, if it's false or an out of area Call Centre they'll find it difficult to answer. Do they have a true local telephone number for the area (be very careful if they have 0800, 0845 or only mobile numbers). If you have a problem with one of these businesses how are you going to get the situation resolved if you only have a mobile number and a false trading address? An example of this is here below, this picture was taken from Yell.com's website. If they have a website again check that they have a proper contact address, many of the sites don't have one! Do they have a Company Registration number? You can check this for free at Companies House. I have yet to find a credible reason why an honest company would try and hide any of the above information. Another deception that has been noticed lately is for companies to buy web addresses with the name of your town in the title to make it look as though they are local to you. For example, a company that comes from South London and wants to pick up trade in the Woodford area could easily buy the web address of www.locksmiths-of-woodford.co.uk in order to make you think they are in Woodford. If you use a Master Locksmith Association approved locksmith it is your guarantee that the company you choose has been inspected and is qualified to do the job, have up to date insurance and importantly that the operatives must have no criminal records.